On Easter Sunday, an adult cottontail rabbit was found dead and submitted for necropsy. Gross findings included trauma, subcutaneous hemorrhage, and multiple puncture wounds, consistent with an animal attack. These organisms were found in the abdominal cavity attached to the mesentery. Given the host, these are likely cysticerci of Taenia pisiformis, commonly called the rabbit taperworm. Cysticerci are larval tapeworms, also called bladder worms because they are fluid-filled, which are infective to definitive hosts ingesting them. Once ingested, the larval tapeworm “bladder” is digested, and the holdfast organ, or scolex, with an adjacent neck attaches to the wall of the small intestine and segments, or proglottids, begin to form at the neck. The tapeworm continues to grow in length within the small intestine by the sequential formation of proglottids, which are intermittently shed in the feces. 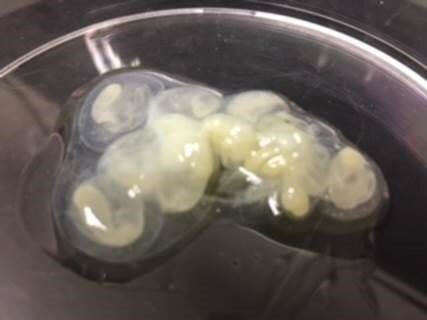 Taenia pisiformis eggs contained within gravid proglottids shed by canids are infective to rabbits ingesting them, leading to the formation of cysticerci within the liver. Cysticerci may remain in the liver, but are more often observed on the peritoneal surfaces of the mesentery.